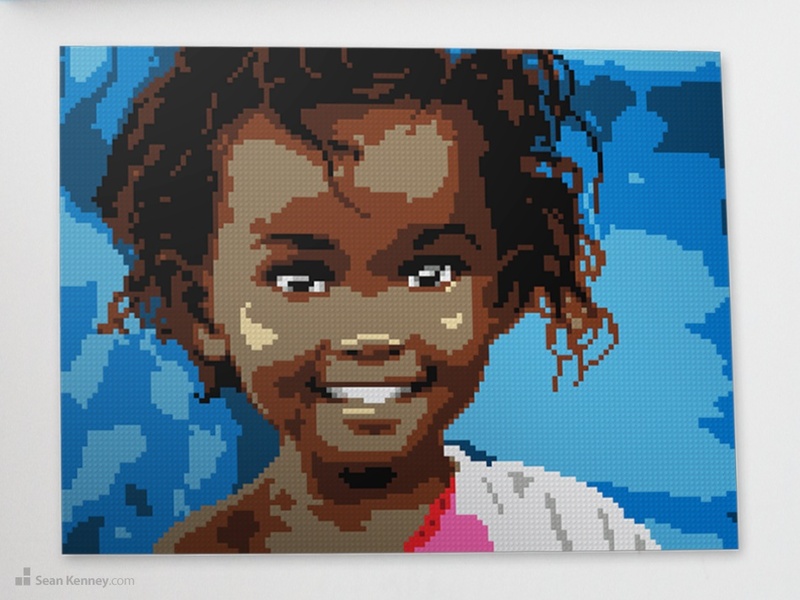 In early 2014 a photo of this little girl went viral; upon seeing the photo I immediately stopped what I was doing, compelled to capture this little girl the only way I knew how — by creating a LEGO portrait. I literally stopped what I was doing and immediately began working on this portrait illustration that very moment. I’ve never felt so compelled in my life. Was it her jubilance, her innocence, her joy and happiness? Or perhaps I saw in her the joy I see in the eyes of my own daughter? Who knows. And I know that a limited, imperfect medium like LEGO (so blocky! so few colors!) is not ideal for capturing these subtleties, but I didn’t care. I simply needed to. Beyond the simple joy of such beautiful innocence, it further warms my heart to see love and the joy of a child conquering the inflammatory hate that made the photo go viral. After a bit of digging, I learned that this little girl’s name is Safa, from Djibouti, photographed in 2008 by The Desert Flower Foundation , a more recent photo of her can be found on their facebook page.